A flat and aerodynamic design is perfect for abrupt maneuvers when cruising at a high speed. Due to the high maneuverability, it is not suitable for beginners. 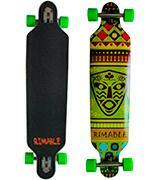 This longboard is great for professional riders because it allows you to quickly accelerate to the highest speeds. Thanks to its compact design and beautiful graphics, the board looks very stylish. 6.9 pounds / 36" x 9"
The rider keeps balance perfectly when riding this longboard thanks to the cover made of fine-grained sandpaper. A stunning design distinguishes this longboard among its competitors. The wheels might rotate slower than they do after a few trips. This model is ideal for downhill sliding due to its low platform that is able to hold direction at high speeds. Perfect model for riders who need balance during extreme turns. 8 pounds / 41" x 9.5"
The unique shape of the deck does not contact with the wheels, even in case of a daredevil stunt. 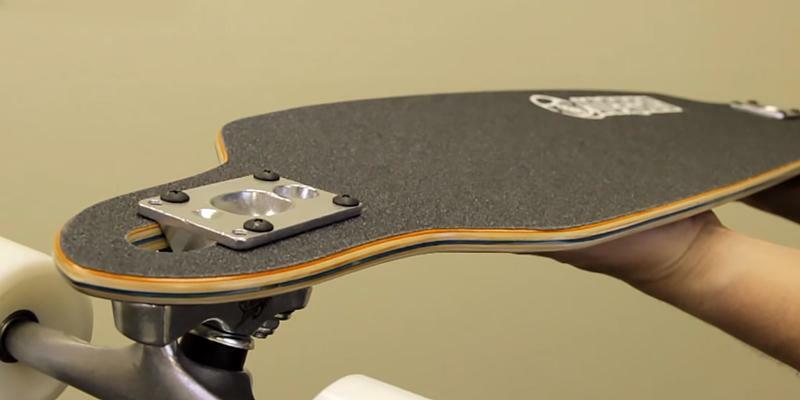 Sandpaper surface of the board ensures excellent adhesion between rider's shoes and the deck. A small radius for maneuverable cruising. Such a board is perfect for both professionals and beginners. You can easily go on a leisurely ride around the city or you can go on a super fast descent down the slope. Thanks to its wide axle of wheels, it is robust even at high speeds. 9 pounds / 41" x 10"
A large deck and high suspension make this longboard one of the best options for riding on an uneven asphalt. The deck damps vibrations well. The initial bearings cause slow start, for speeding you might want to change them. The Quest longboard skateboard has a kicktail to perform freestyle tricks. This will also help maneuver city streets with crowds of people. 10 pounds / 44" x 9"
Soft wheels provide excellent road adhesion at high speeds. A unique graphic design will favorably distinguish you on the road from other longboard fans. Bearings must be replaced if you want better performance. 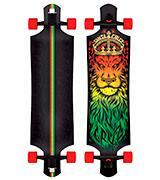 Whether you are a novice or a professional rider, you will surely enjoy riding Rasta Lion longboard. 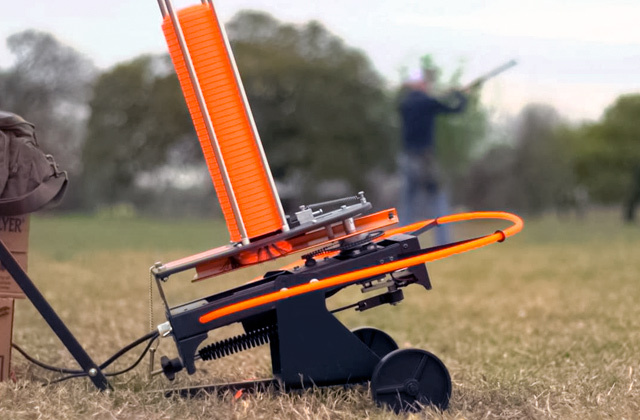 It boasts excellent maneuverability, allowing you to perform tricks of any complexity. 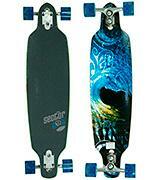 7 pounds / 40" x 10"
The Sector 9 is a great choice for cruising or calm riding in the nearest park or neighborhood. 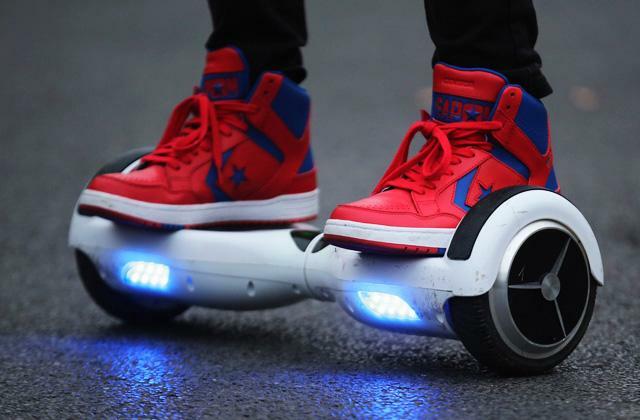 Thanks to its design, you'll be able to skate on different surfaces, smooth and coarse, and perform various tricks. Thus, you can use it not only for cruising but also for freeride. Also, if you’re a fan of a downhill riding, the Sector 9 is an excellent choice due to its low mounting design which allows you to keep the balance at high speeds. The board is made of a laminated 8 ply maple, so the deck is lightweight and very durable. The concaved shape of the deck is well suited for cruising so that a rider can race and accelerate. Also, a deck shape like this ensures good kick during high-speed riding. The surface of the deck is covered with a fine-grained sandpaper, the best material for keeping balance while riding a longboard (your feet won't ever slip off). You can notice aerography that looks like a wave on the underside. Gullwing Sidewinder trucks are attached to a drop-through deck, providing great stability and maneuverability at high speeds. Since the size of the axle is only 180 mm, the turning radius is rather small. The 70-mm wheel diameter is sufficient for any even surface because of 80A hardness and what’s more, it helps pass rubbles and potholes on the road. The Sector 9 is equipped with ABEC 5 bearings which are good for cruising and freeride. Yet, if you prefer sliding down the hill at high speeds, you may want to consider longboards with ABEC 7, 9 and 11 bearings. First of all, we do know that everybody has their own comfortable stances and moves developed with time and practice so what we are saying here is a mere suggestion, not a must-do order. But it might help. The second thing we want to say is this: before you try to gain speed get used to slow riding, find your balance, and learn to stop and hop off your longboard. Third: please, please wear protective gear at least while you are learning. That's it. Now to the accelerating. 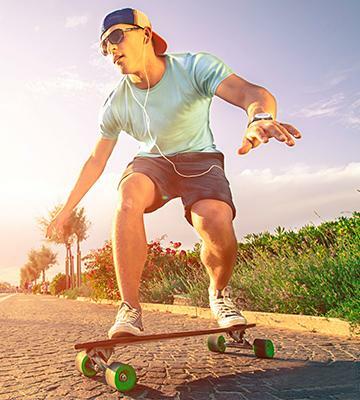 Kicking your longboard means adjusting your balance to take one foot off the deck and push the ground with it but every time you do it you slow down a little. That's inevitable. 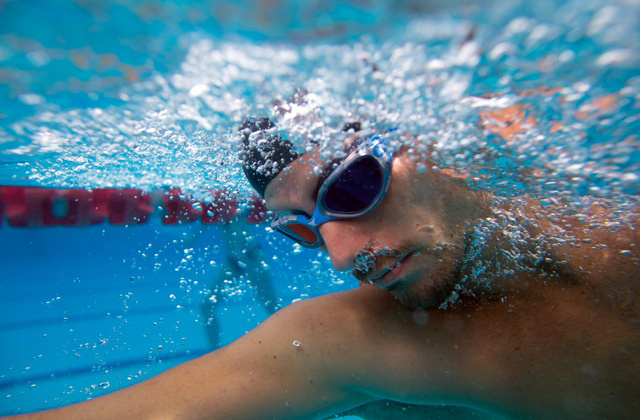 When you are ready and willing to go faster than usual, here's what you can do. To make fewer kicks, you will need to make each kick longer. Take your pushing foot (back foot generally or front one if you push mongo) off the deck and put it further in front of the board, optimally somewhere around front wheels, then push it all the way before you put it back on the deck; add the effort to the kick to acquire velocity. This way, you will build momentum and speed better without the need to push too frequently. Try to keep your body relaxed when you do it, though, as frigid stance makes it harder to balance. That's it. You'll need some practice to master it so choose a large flat surface at first then move to some low hills when you've got a hang of it. 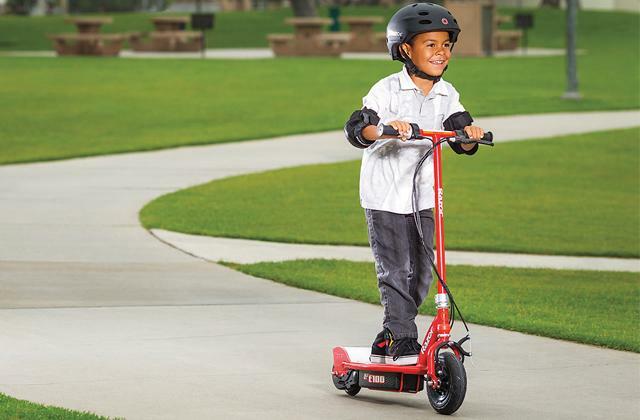 Electric kick scooter is another great option for commuting, fast, environmentally friendly, and easy to use. And they are somewhat safer so perfect for your kids before they master a longboard enough to ride to school. 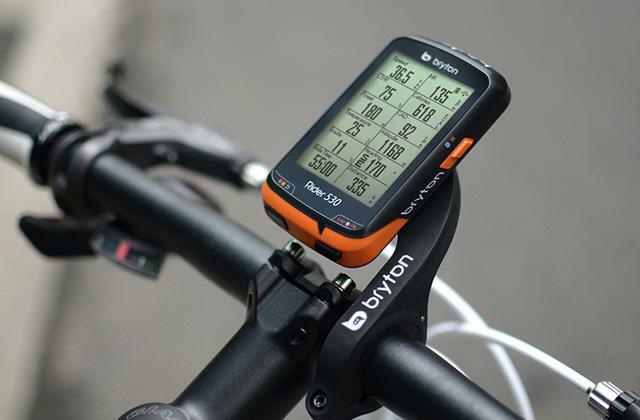 If you are a fan of downhill or cruising, the product by Rimable will be a great pick for you. It’s a cross-functional longboard suitable for a wide variety of riding styles. 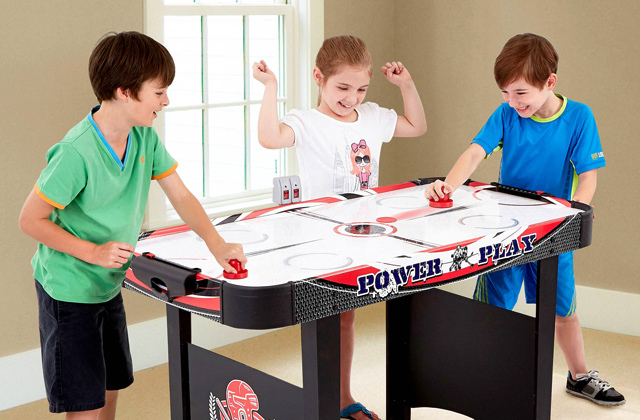 It’s important to note that using this board allows you to perform tricks and sliding. 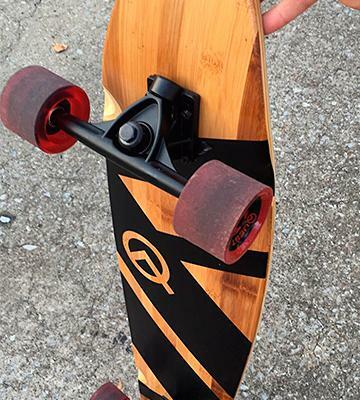 Thanks to its multi-purpose design, this longboard is good for both beginners and skilled riders. Moreover, it has good maneuverability for your comfort when cruising around the city. Due to the 9 ply maple, the deck is very robust and lightweight. The shape of the board is slightly concaved at the tail and the nose for comfort cruising and performing tricks. 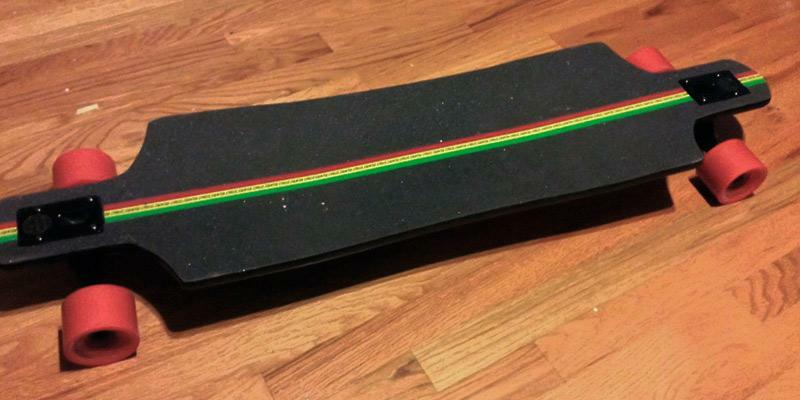 Just like the other long boards, this one is covered with an abrasive cloth strip for a better balance of the rider. 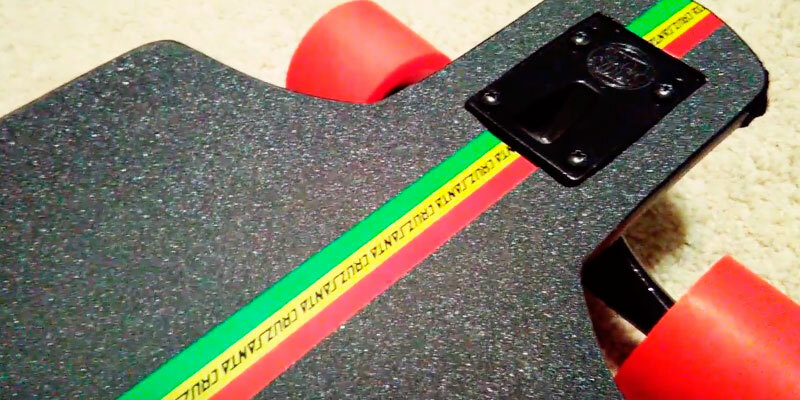 However, there are 2 strips without abrasive cloth that give the longboard a rather sporty look. The color does not fade away and the deck looks new even after a long period of use. Also, there are stickers on the reverse side of the board. 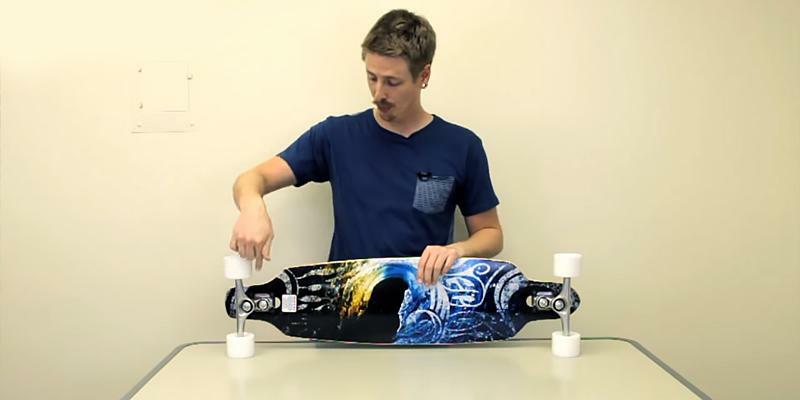 This longboard has a drop-through truck mounting and the trucks are 180 mm wide. Thus, the unit is lowered and, what is important, fantastically balanced. The 75 mm PU wheels with 85A hardness provide for better sliding down the hills. Therefore, they offer nice sliding while you are performing stunts. These wheels are durable and give a smooth ride on rough terrain. Also, we should say that you will be able to achieve impressive acceleration thanks to the ABEC 11 bearings that allow this board to move as fast as 100 km/h (~62 mph). Footbraking. This one is the first way to stop many riders learn as it is best suited for slow riders. To put it simply, you do the same thing as when you push but instead of, well, pushing and getting both feet back on the deck you just drag the foot flat on the road surface. Don't try to stop abruptly, take your time to slow down. Jumping off. This is probably the first thing a newbie rider would think about when the speed is too high and it gets scary. This is not the most recommended way of stopping, though, as it has high injury rates. If you jump off the deck, you will need to run for some time still, and you may lose your board. That is if you succeed in not falling. If you don't, pray you have your protective gear on, otherwise, you might end up in quite a pain and with a couple of broken bones. Try practicing the right way to fall beforehand. Coleman slide. This is the safest option to stop your longboard at high speed but it will require practice. Also, you will need sliding gloves in addition to your standard gear. 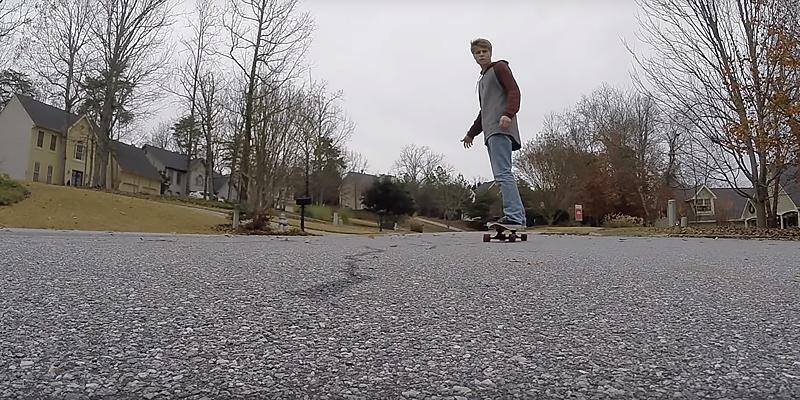 You can find step-by-step instructions on the Internet but basically, sliding means you squat carefully, lower your pushing leg knee to center on the board, and with a gloved hand on the pavement and the other hand swinging you turn your longboard sideways. The speed drops dramatically and it is easy to stop completely. 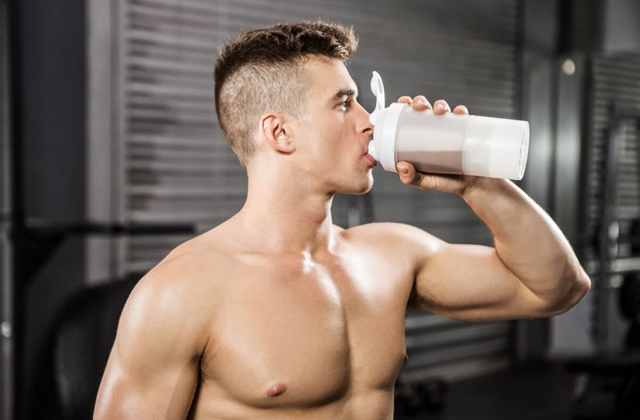 When you are practicing hard or you are simply in a hurry, you might have no time to stop and eat. To get some strength, carry protein bars with you and have a snack without stepping off your longboard. Just don't forget to eat properly when you get home. 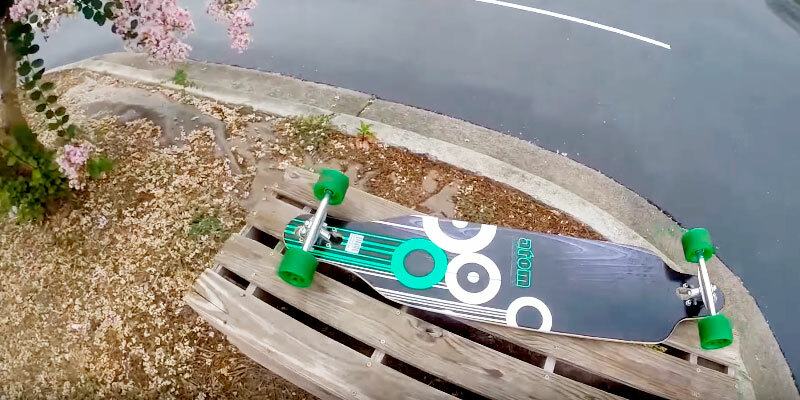 It should be noted that Atom Drop Through Longboard is great for both beginners and skilled riders who like cruising in the parks or ride at high speed. First of all, this board has a cross functional shape of the deck, so you can use it not only for cruising but also for downhill riding. The deck has a nose and a tail, allowing you to easily change the direction while performing tricks. This strong and decent board is suitable for different riding styles and meets the needs of all riders. An important point is that the deck is made of a single-piece maple, so it’s very durable and lightweight. The board has a slightly concaved shape, so it shows an excellent performance during acceleration. The edges are slightly bent, which provides better control while riding. The surface of the deck is covered with an abrasive cloth strip to provide the balancing of the rider. The aerography on the underside is a nice supplement to the design. What we should emphasize about this long skateboard is its low drop-through suspension. It has a 245-mm axle that provides a good balance for downhill riding and, in addition, it prevents swaying at high speeds. As for riding at a low speed, cruising in the areas with intensive road traffic may be rather inconvenient due to the small turning radius. By the way, the wheels are made of urethane and their diameter is 70 mm. Also, the bearings are ABEC 9 - great for high-speed riding. Longboards are generally good with riding down hills but there are recommendations to be followed. It is better to choose the hills that end with smooth slopes, they make it easier to slow down and stop. Or you can use a turn into some alley or empty lot. Walk down the hill beforehand; you will feel more relaxed and calm when you know what awaits you at the end of your downhill ride. Another thing to take into consideration is the surface quality. Although a longboard with large wheels like Atom Drop-Through will handle even bumpy road to some extent but you will still feel the difference between quality surface and a not-so-quality one. And the last requirement: for speedy rides like these please select the hills with minimum pedestrians and vehicles. This is your own safety and the safety of those around you, don't take it lightly. 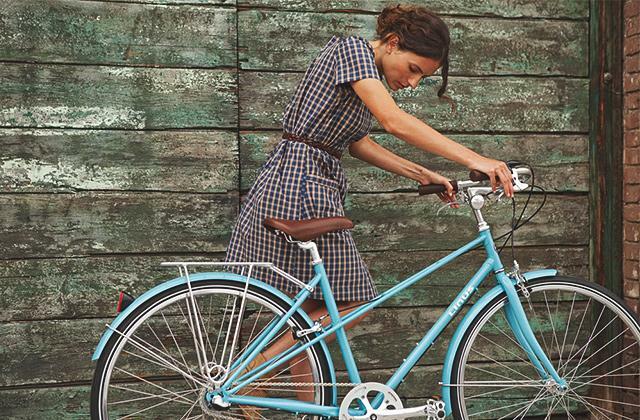 To ride longer distances and a variety of terrains including grass and sand, consider buying a cruiser bike. It is made in a way to be the best choice to commute with utmost comfort. 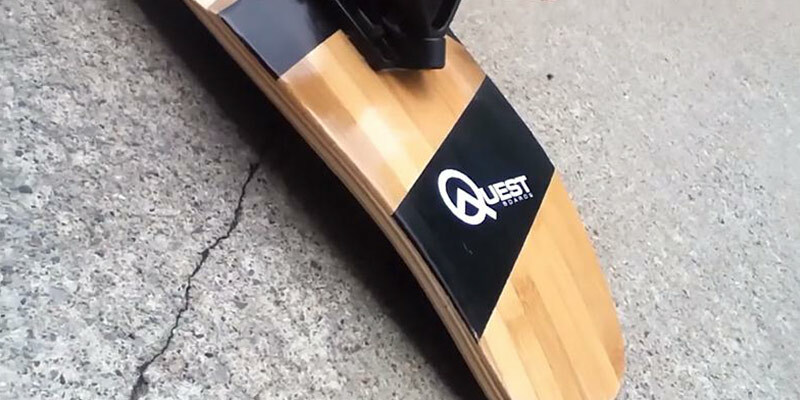 Quest Skateboards Super Cruiser is a great longboard for cruising and dancing. 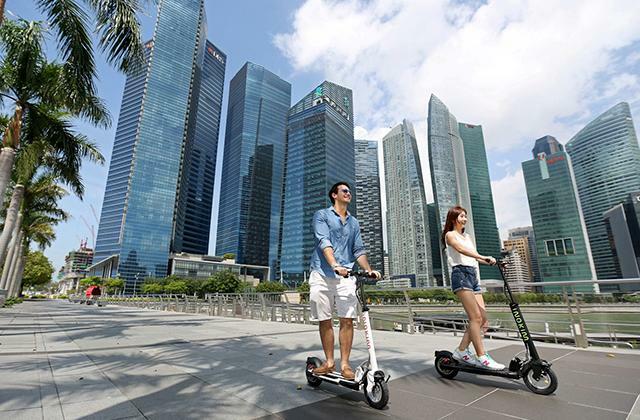 Ride slowly via an esplanade feeling on top of the world. It is so stable and well, long, that you will easily perform tricks and even dance on it! All eyes will be on you! 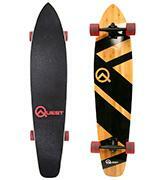 Furthermore, the Quest longboard is equally comfortable for beginners and for riders with years of expertise. Be it a street performance or just a way to ride through your town, this longboard is a way to go. A pintail deck of these Quest Skateboards is a great choice for long walks or just traveling fairly far places. With a comfy kicktail, you will easily maneuver tons of people on your way and bypass obstacles. And you know what? That's still far from all of the good news. 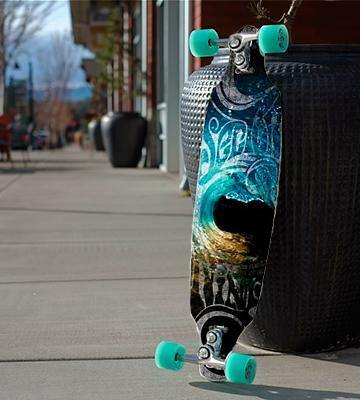 This longboard looks stunning, you'll see just about everybody staring at it when you ride. The deck is a multi-ply maple and bamboo, and we assure you it is really flexible, durable, and will serve you or your kid for many years. Covered with a grip tape on the top, it provides wonderful adhesion. And the bottom side is a coated wood that looks extremely elegant. This longboard features suspensions with reverse kingpins which make it more stable if you speed up. The suspensions themselves are 178 mm wide. This is in order to make the board easier to maneuver as the radius is not large. Due to the ABEC 5 bearings, the Quest Skateboards Super Cruiser Longboard may not speed up as fast as freeride boards do, but it does keep the speed well when you reach the desired one. The 70-mm polyurethane wheels ride so smoothly you will never notice the road unevenness. Riding it is a lot of fun! Aside from the gear, remember one important rule: always ride with a speed you can control. Your riding speed shall not exceed the speed you can run at, at least not much. This way, if you happen to jump off the longboard, you will have better chances at doing it without falling. Electric bikes are a good option for those who ride uphill a lot, they require less effort and they are eco-friendly. Take a nice ride to enjoy the view without getting fatigue and sore muscles. 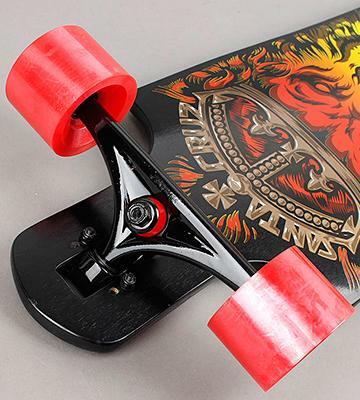 The wide deck of Santa Cruz longboard will satisfy all fans of freeriding. 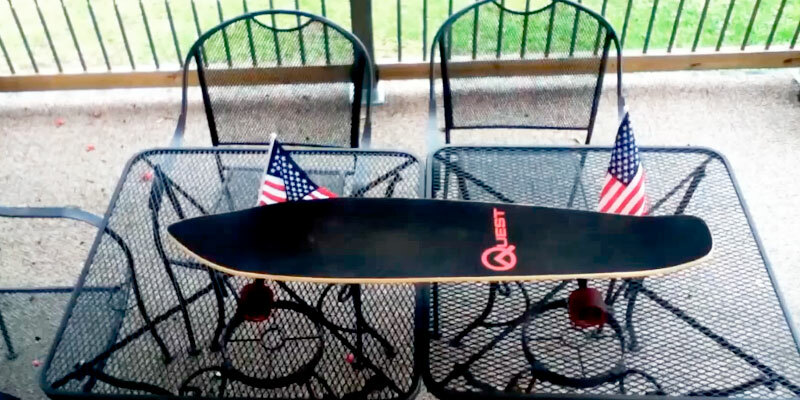 Moreover, if you like performing different tricks, this longboard is a perfect pick too. One big advantage of this unit is that it’s suitable for skilled riders as well as novices who have just started practicing different riding styles. Also, you can cruise around the city on this longboard, since it is stable and very easy to control, especially during rush hours. Like other rival models, the deck of this one is made of the 8 ply maple, that's why the item is lightweight and durable. The deck construction will surprise you when you first try it at freeriding. The deck design is symmetrical, with large wheel grooves that allow performing tricks and jumping down the steps, hopping on the pavement, and so on. 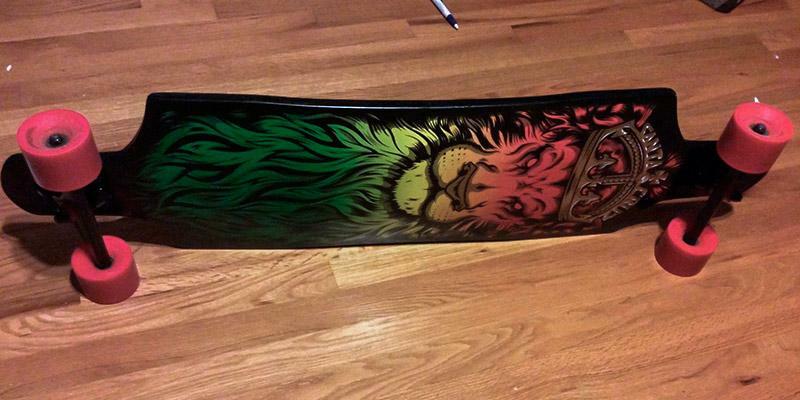 The surface is covered with an abrasive tape, and on the reverse side, you can find some Rasta Lion aerography. 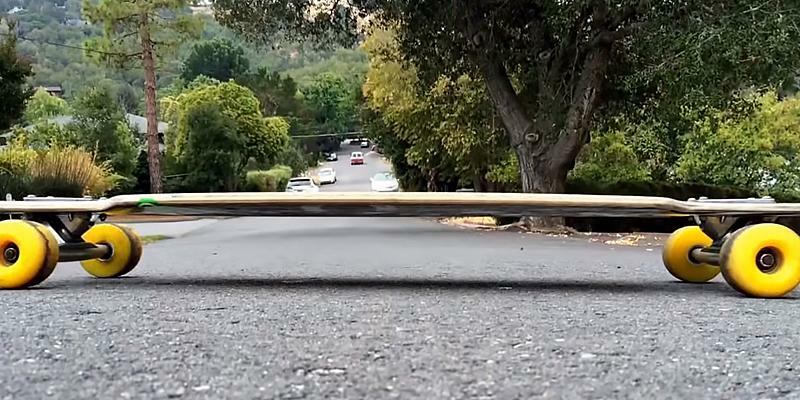 The drop-through truck mounting makes this long skateboard fantastic for freeriding. As for the trucks, they have 180-mm axles. This kind of suspension gives you full control over your board and ensures excellent maneuverability. 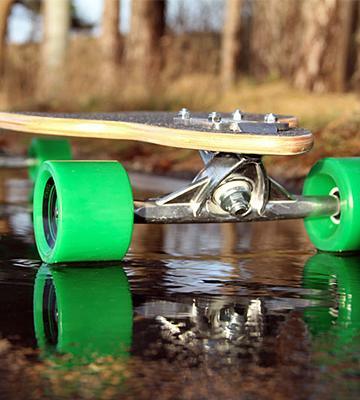 The wheels are made of urethane, a material considered to be the safest one for longboard wheels. The hardness and diameter of wheels are 78A and 75 mm respectively, they provide good sliding while performing various freeride tricks. Bearings are important when it comes to skate- and longboards, and to prolong their life, you will need to check them regularly and perform maintenance. When you start to hear noise from the bearings or the wheels start to rotate at different speeds, it is a sign you need to clean the bearings. 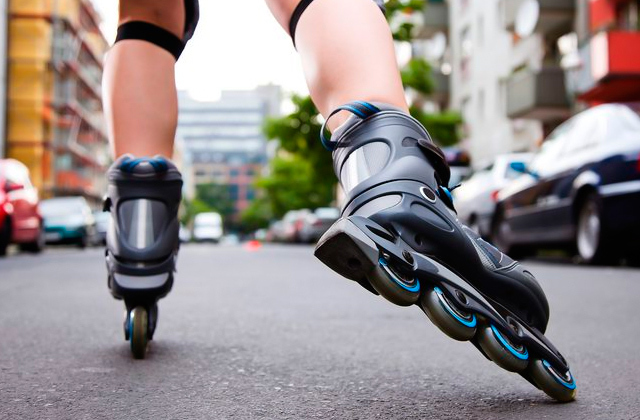 It is also highly recommended to clean the bearings if you happened to ride on a wet pavement as it may result in tiny parts being stuck inside and wearing the bearings out. To clean the bearings, you may use alcohol or some special solvent. From time to time, it is required to lubricate the bearings. A sewing machine lubricant will suffice. Before you start either cleaning or lubricating the bearing of your board, dismount the wheels and take the bearings out. If you try to do any maintenance without it, you might damage it. Unicycles are still a sight we are getting used to but there are more and more of them on the roads. They are a creative and fun way to move, and the latest models are equipped with everything you may need for an easy and comfortable ride. Constructed in a similar way to a skateboard, a longboard has better grip and hardness for cruising and riding on rough surfaces. As a counter to any typical skateboard, the longboard isn’t used for performing tricks or jumping. Offered in the variety of shapes, longboards differ in their longer decks and softer, bigger wheels. This all ensures greater stability and safety of the rider and allows for comfortable riding around the city and transportation. In the following review, we’ve selected 5 best longboards and their most important features so that you can find the most suitable one. However, if you’re not sure about a longboard, we recommend you to check our comparison of the best skateboards. Shaped and constructed differently, all longboards are suitable for different needs. Cruiser longboards look very much like typical skateboards but slightly differ in design. With a kick tail, their deck is also a bit longer and reaches about 41 inches in length. It’s good if it's designed with the tail and nose to easily follow the chosen direction. If you’d mainly like to do cruising on rough surfaces, it’s better to go with a flex deck that greatly reduces vibration on bumps and hills. Those who prefer calm cruising to mad racing should consider electric models. They are easily controllable and well-balanced. If you’re buying a longboard to try out your skating skills and ride down the serpentine roads, it’d be better to go for one with a lowered deck fixed at 36-45-inch distance above the ground. The fans of downhill riding may also want to consider the longboards with concave decks or longer wheel bases. 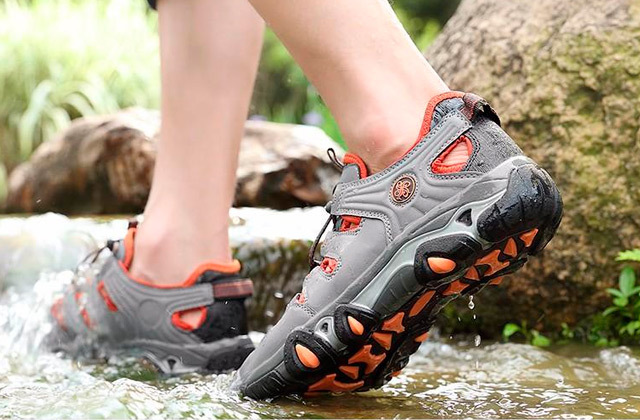 They provide enhanced stability and safety when turning and riding down the hills. Freeriding is another popular way of skating which involves jumps from the stairs, jumps on the curbs, and some other tricks that may be performed while riding downhill. 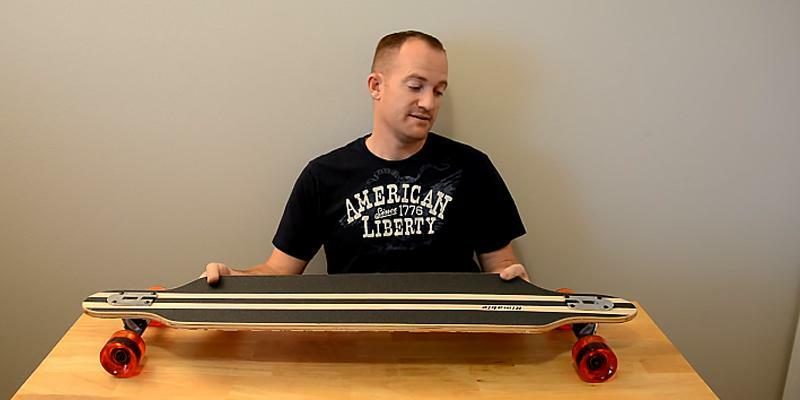 The longboards for freestyle riding reach 37-41-inches in length and about 8.5-10.5 inches in width. They’re also a bit stiffer to standard decks. Pay attention to the material which a longboard is made of. As a rule, all longboards are made of solid wood, though you can also find plastic models. 8-9 ply maple longboards are recognized as most durable and lightweight. Plastic longboards are a bit heavier. They are also suitable for all weather use. Make sure that the surface is covered with the grip tape to provide greater stability when in use. Colored differently, the grip tape is replaceable, allowing you to change it at any time. The choice of colors and designs is truly vast so you’ll definitely stand out from the crowd with your unique, vivid longboard deck in the street. 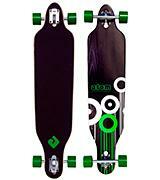 The longboard consists of the deck and trucks (suspension) - most important components that should be considered. There are also two possible ways to connect the skateboard truck to the deck - top mount and drop through. The top mount is a traditional way when the deck is directly connected to the wheels while the drop-through mounting implies the connection of the truck to the deck through some special cutouts. Longboards with drop-through mounting ensure greater stability and balance, allowing for easier pushing and racing. 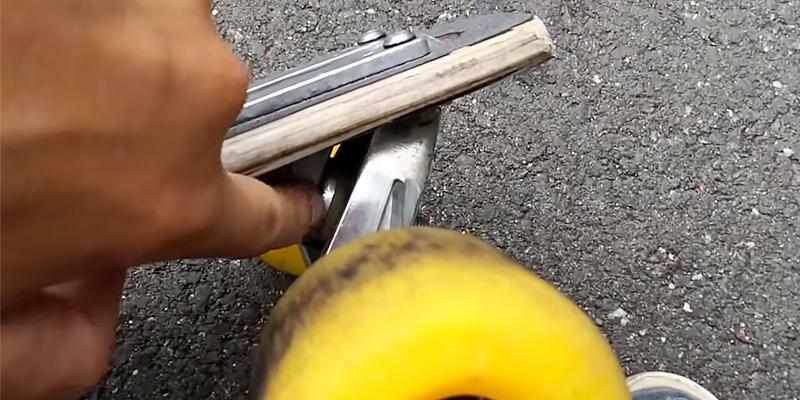 The full control of the longboard is possible thanks to the bushings. However, the size of the truck should match the riding style. 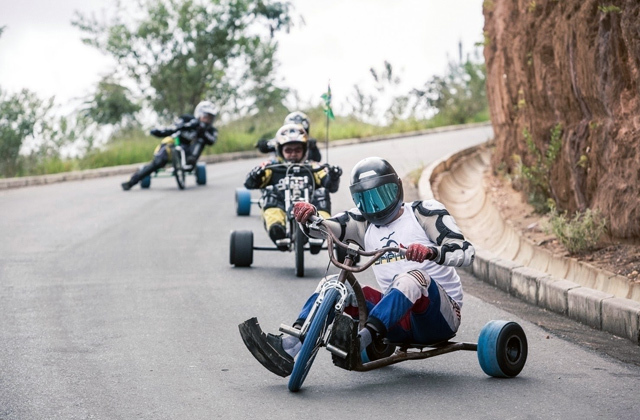 For example, if you need the longboard for downhill racing, you can choose the one with a low-wheeled suspension (or, in other words, drop-through deck), which will keep up the speed very well. If you need a longboard for cruising in the park, you can choose the one with the top mount deck. 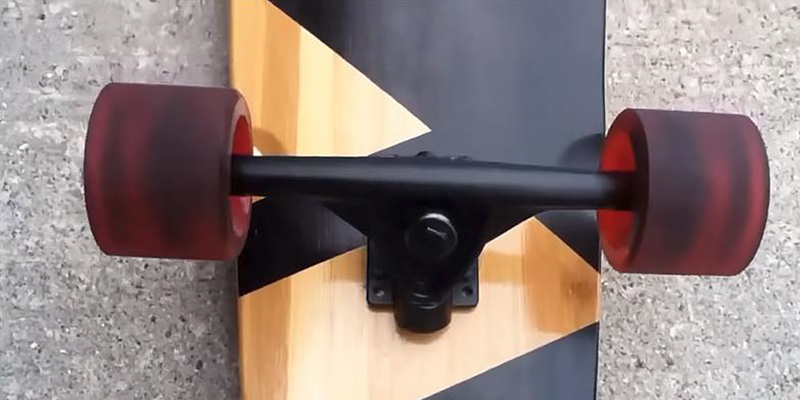 From the technical point of view, the suspension of longboards consists of several components, the most important of which is a baseplate (with 4 holes) attached right to the deck. 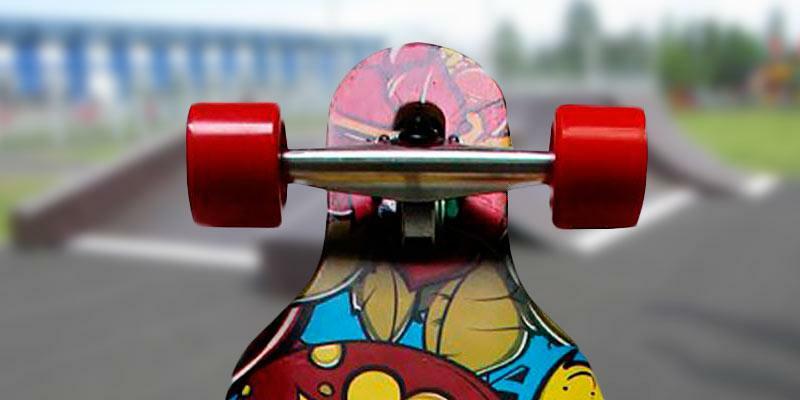 The baseplate is connected to a hanger with the help of the kingpin, which drops through bushings (the pieces of urethane located on the longboard truck). Don't forget to pay attention to the wheels. Usually, all manufacturers make the wheels of urethane, because this material is the safest for skateboarding. You can also distinguish wheels by their rigidity: the softer the wheels are, the better the road grip will be. For example, you need big and soft wheels (75-79A) for downslide riding, but the wheels from 78A to 81A are suitable for cruising or freeride. The diameter of most longboard wheels varies between 62-99 mm. The wheels of a bigger diameter (80 mm and more) are faster and get higher acceleration, but you need to put more effort into it. However, huge wheels are quite good for zipping through small stones and other road obstacles. As for small wheels (60-70 mm), they aren’t so fast, but they’re easier in getting acceleration. If you’re a novice, longboards are the best option for you. Also, you should pay attention to the bearings that affect the speed of the board. Typically, there are bearings (ABEC) from 1 to 11. The higher the ABEC is, the faster the longboard will move. For instance, you should use ABEC 11 for downhill and ABEC 5, 7, 9 for cruising and freeride. Q: How is longboard different from a shortboard? A: As the name indicates, the main difference is the deck length. A bit more in-depth answer will be as follows: shortboards are commonly used to do tricks and to commute to school/work whereas longboards are designed, first and foremost, for cruising the streets. With the difference in intended use came the difference in design for all the parts. In addition to a longer and often heavier deck, longboards are usually equipped with larger and softer wheels that absorb the road bumps for you to ride with utmost comfort. Q: Do I only cruise on a longboard or can I do tricks and commute too? A: Experienced users can, of course, do tricks on a longboard, although it is not as common as with shorter skateboards. As for the commuting, shorter boards are preferred mostly because you will need to carry the board when you are in the areas prohibited or not suitable for riding so a lighter skateboard will probably be more convenient. 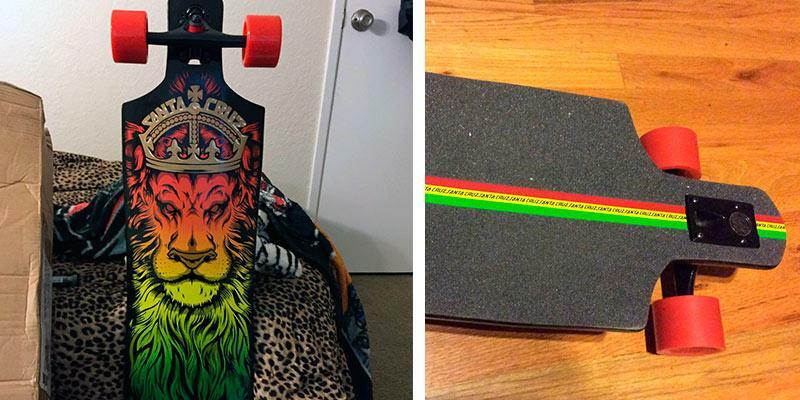 Q: Which is faster—a longboard or a standard skateboard? 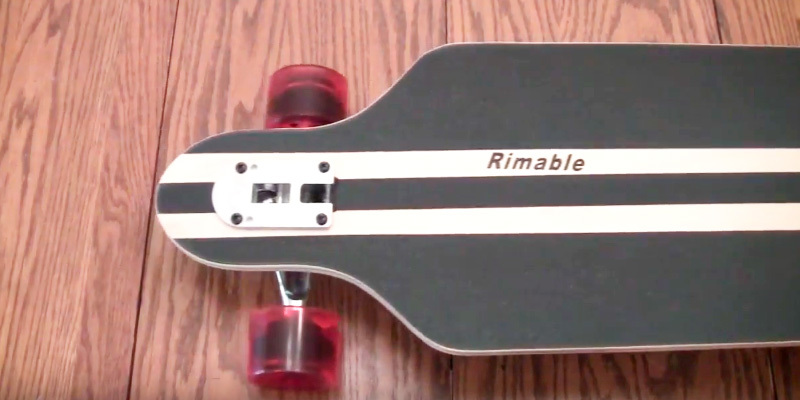 A: The speed is not generally affected by the deck length but by the wheels and you can set specific wheels on your longboard the same as on a short skateboard. If you intend to ride your longboard mostly in parks, you should probably consider harder wheels. But note that on pavement or any other uneven road, hard wheels will feel every crack and bump and will inevitably slow down.Then there is also the wheels size. The start will be slower on the bigger wheels but the top speed you can reach will be higher, and vice versa for smaller wheels. Q: Does a longboard need any specific maintenance? A: First of all, if you live in a region with high precipitation levels be ready to perform check-ups and maintenance more often. Also, you’ll need to look at the parts more frequently if you are a hard and avid rider.The wheels wear off, of course, you will see it and feel it. Rougher roads wear them off faster. The axle and the kingpin nuts are to be replaced once a year or depending on how often you renew your board’s wheels. The bearings should be checked to spin freely and not stop abruptly; see to them roughly once every three-four months but you might want to try cleaning them before you decide to replace them. Also, keep them away from sand and try avoiding puddles when you cruise. The bushings get stiffer the longer you ride; those are to be replaced if you start to feel the effect. Grip tape—any time you feel like it, you can replace it. There are also times when trucks start to squeak, in this case, check the pivot cup, it may need lubrication. Q: Do I really need protective equipment if I’m not going to do tricks? A: Short answer: YES. Longer one: you are not entirely safe even if all you do is ride and you do it cautiously. The world is fast around us, there are cars and people running around; you can fall or get pushed accidentally. At the very least, a helmet is a must. And even experienced riders wear gloves and pads when riding downhill. Better be safe than sorry. 1. 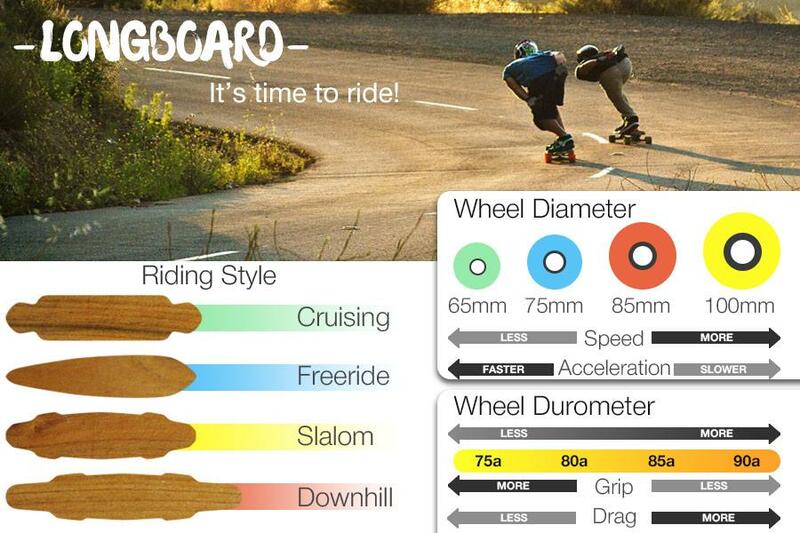 HOW TO BUY LONGBOARDS: DECK SHAPE & STYLE GUIDE, evo. 2. Choosing A Longboard Deck, Tactics Board Shop. 3. Longboard Skateboard Buyers Guide, Warehouse Skateboards. 4. How to Choose the Right Longboard Skateboard, The House. 5. 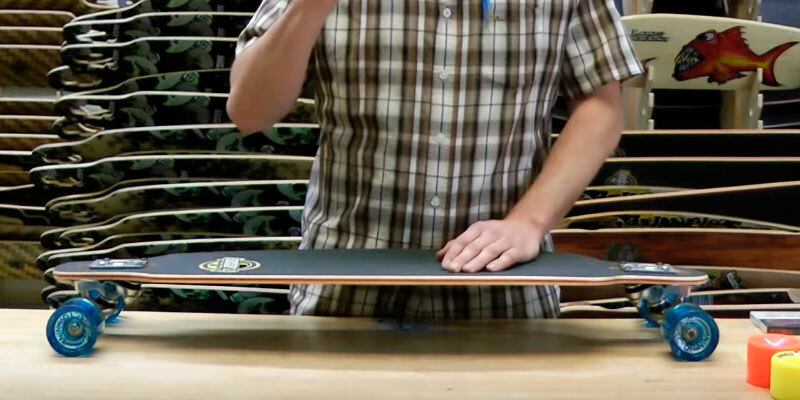 Longboard Buying Guide: Frequently Asked Questions, MuirSkate Longboard Shop. 6. Longboard Buyer's Guide, Daddies Board Shop.